There is no one-size fits all answer to planning the perfect mountain wedding. Flipping through bridal magazines, it’s not uncommon to find stunning images of couples in front of the Chateau Lake Louise or the iconic Banff Springs Hotel. 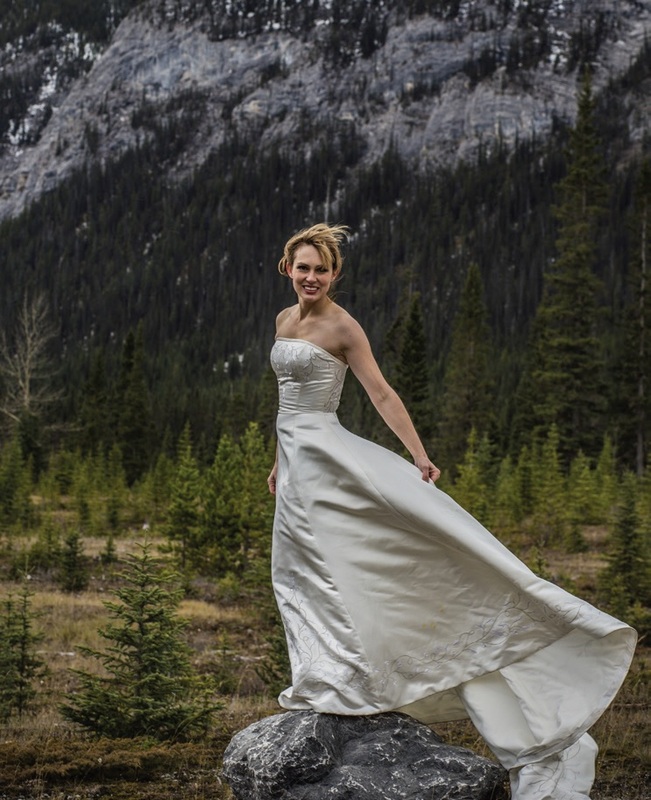 As glamorous as these weddings are, they don’t necessarily reflect the diverse tastes of couples who choose to get married in any of Western Canada’s majestic mountain parks. In fact, there are hundreds of unique locations and venues that just don’t get near the amount of buzz they deserve, despite their potential to make some guests wish they could have a do-over of their wedding. In no particular order, here are 8 of our favourite venues that might appeal to wedding couples wanting to break the mould on their big day. Hillside Lodge, Golden. Photo Courtesy of Kat Hadford Photography. Just outside of the town of Nordegg, adventure and fun await the couples who choose Goldeye Convention Centre for their wedding. A summer-camp style centre complete with a ropes course, zipline, field house, kayaks and canoes, this unique venue offers an action-packed wedding weekend to be had by all. Lodgings range from basic dorm-style cabins to more traditional hotel-like rooms. A full-service kitchen serves up 3 meals a day for all who choose to stay. A woodsy amphitheatre nestled in the trees provides a shady seated area for a ceremony, or couples can opt to hold the ceremony anywhere on the grounds, from lakeside to indoors. There are plenty of options for the reception as well, including a cozy log-cabin style dining hall. But in a location like this, who wants to stay indoors anyways? 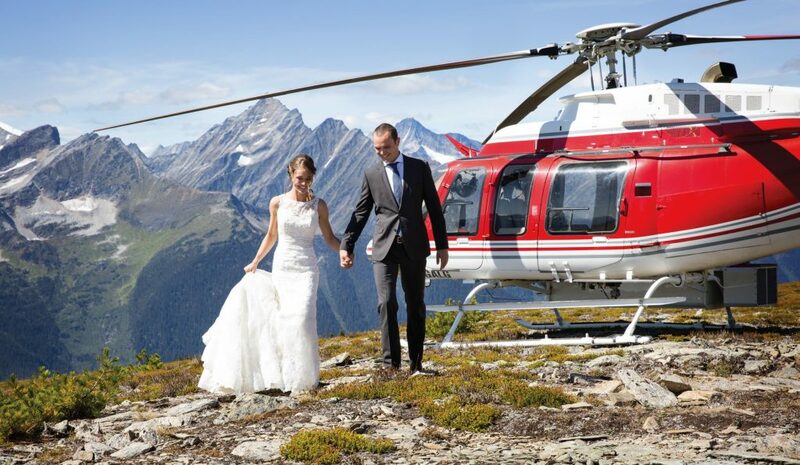 Heli Wedding, Golden. Photo Courtesy of Kat Hadford Photography. Just 13 km west of Golden, Hillside Lodge and Chalets offers a completely different aesthetic compared to its neighbours at Heather Mountain. 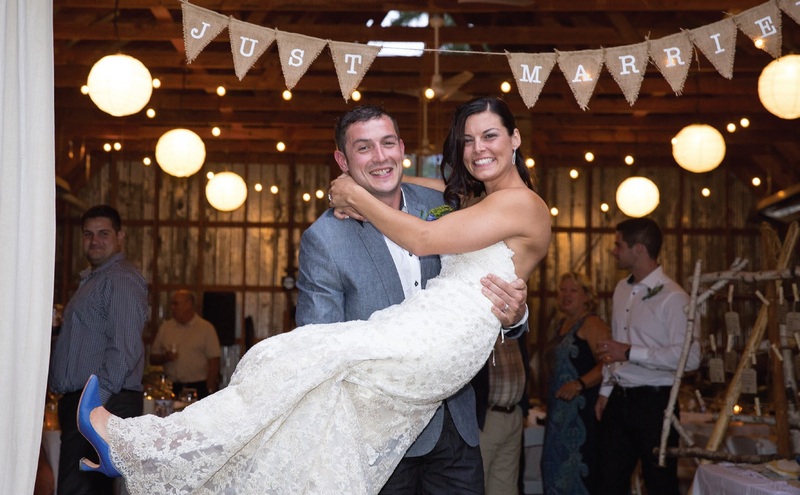 While both have the panoramic vistas of the Rockies in the background, Hillside offers a timeless barn venue for up to 120 guests for a more down-home country style reception. Charming log cabins with kitchenettes make it an ideal place to stay on a long weekend for those who want to keep the celebrations going. 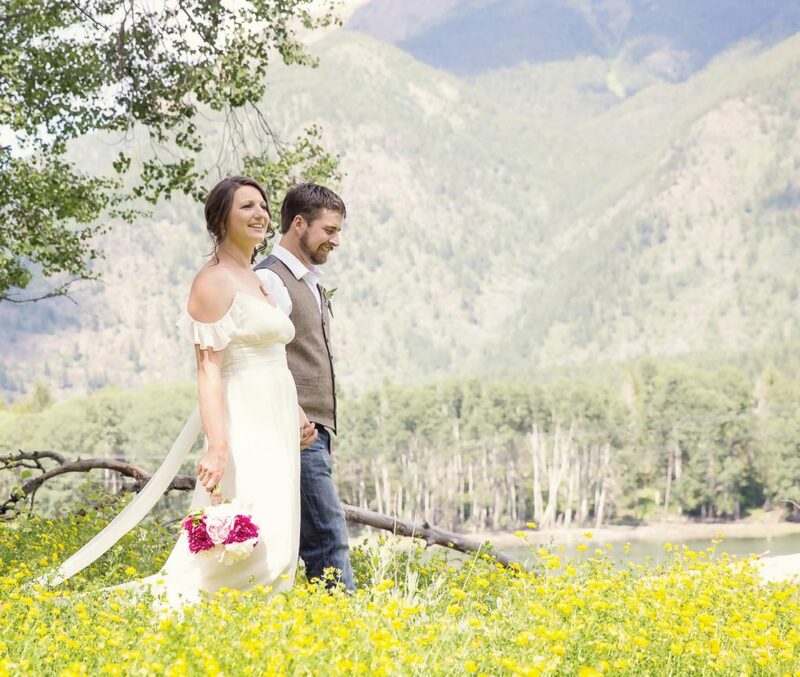 If you are debating between having a picturesque mountain wedding, or getting married in a traditional chapel, you can have both at Mulvehill Creek! Set on 33 acres on the shores of Arrowhead Lake, this unique venue is the perfect spot for an intimate wedding. If spectacular backdrops for photos are a must-have, you are seriously spoiled for choice here between an on-site 300-foot waterfall, lakeside on the beach, or deep in the forest. Comfortable guest accommodations are available including a honeymoon suite for the newlyweds. And after the wedding day, you can have some fun and relax in the inviting waters of the inn’s outdoor saltwater pool. Just off the beaten path, in a protected alpine valley, lies a unique back-country venue for the more adventurous types. Diana Lake Lodge is a simple but cozy spot perfect for a very small group or elopement wedding. A one-room log cabin houses a kitchen, living space and sleeping area for up to 8 guests. 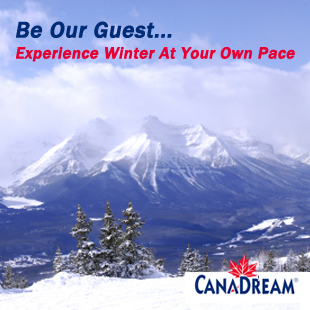 With both catered and self-catered options and an onsite caretaker to ensure the smooth event, you can focus on enjoying the breathtaking ridge walks and alpine flowers that bloom all-season long. 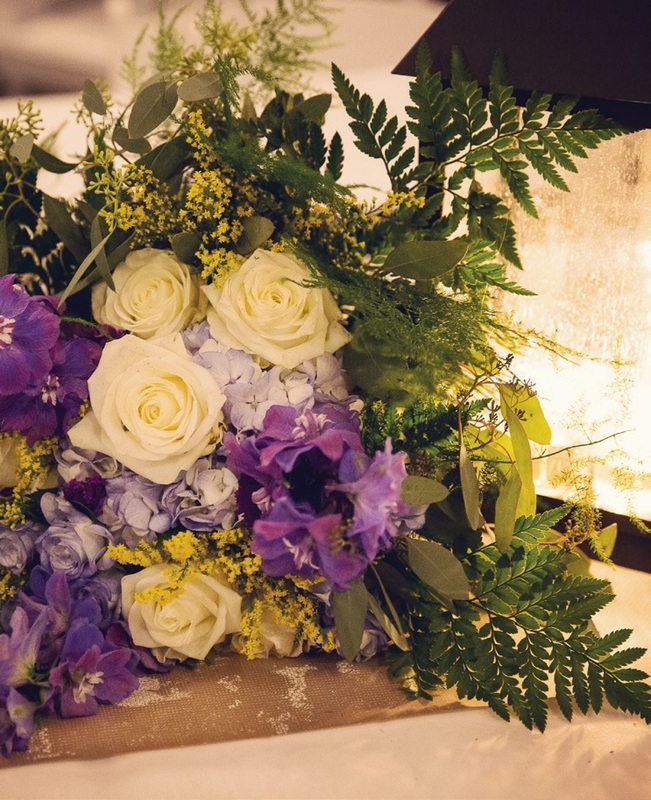 The lodge’s management maintains a flexible, open-minded attitude to try to accommodate specific requests for guests wishing to make this picturesque venue the background to their intimate wedding. Photo Courtesy of Silverlight Studios. Calling all tree-huggers! If you want to make an impression on your guests, and not on the environment, then this may be the perfect place for you to celebrate the start your eco-conscious life together. Completely off-grid, Nipika Mountain Resort runs entirely on solar energy, recycles everything possible and uses locally sourced deadwood for heating when attainable. Up to 70 guests can stay in one of the stylish log cabins and the potential for finding an unforgettable ceremony location is boundless. Just 45 minutes east of Radium. For those seeking an authentic western experience, Bull River Guest Ranch has 200 acres of peace and tranquility awaiting them, only 40 minutes from Cranbrook. 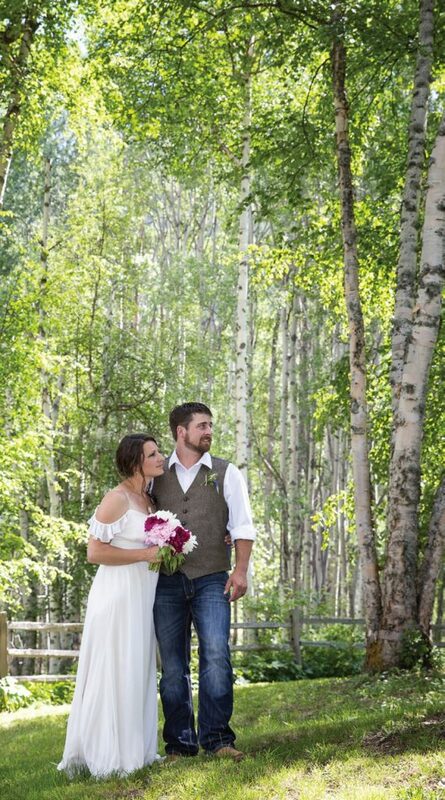 This venue offers sensational views of the Rockies, lovingly landscaped grounds and a self-catering longhouse big enough for up to 120 guests! The cozy western-style quarters include 7 log cabins with full kitchen facilities, handmade patchwork quilts and romantic riverstone fireplaces. The ranch can arrange for a number of activities including horseback riding, rafting and fly fishing trips, and there is no shortage of hiking trails on the adjoining thousand acres of crown land. Near Bull River Guest Ranch, Cranbrook. Photo Courtesy of Kat Hadford Photography. Have you ever dreamt of having your own little island to escape from it all? You would be completely surrounded by pristine water on all sides, enjoy all the comforts of home and of course, you’d bring all your nearest and dearest people with you to keep you company. Now imagine that this is actually possible for your wedding day when you rent the entire island at Emerald Lake Lodge. While this is only one viable option for hosting a wedding at Emerald Lake Lodge (less exclusive packages are also available) if you’re the kind of couple who takes the “go big or go home” approach to life, then why not shamelessly indulge in the luxuries that go with having your own private island complete with staff to cater to your every need (even if for a short while)? There really is no wrong way to plan a mountain wedding as long as you plan it YOUR way. The possibilities are as vast as our beautiful Rocky Mountains.